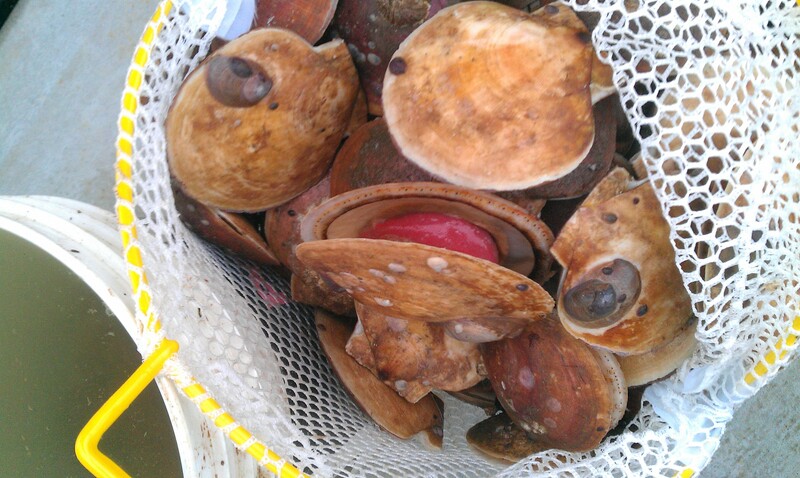 Scallops caught on Opening Day of the scallop season (December 2012). Without meaning to, my (scallop) gonads have made internet fame in the last few days. I’d like to followup with a few short comments on why these samples and this kind of research is so important. I actually wrote about this topic previously in the context of policy meetings. 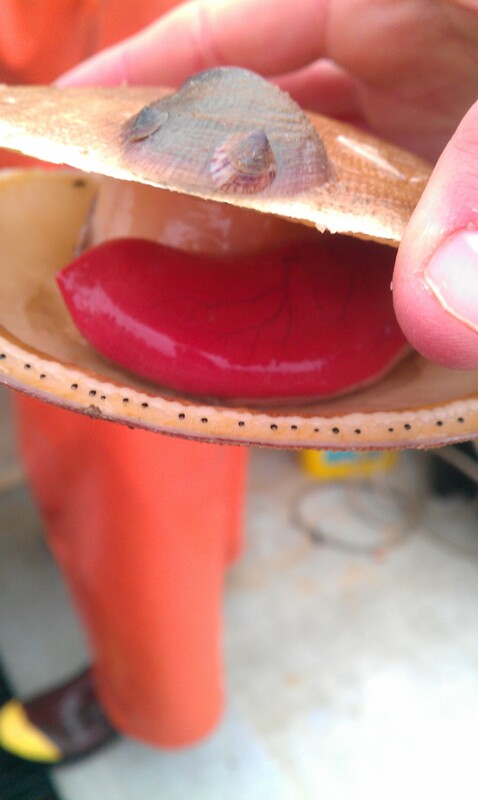 The giant sea scallop (Placopecten magellanicus) is one of the east coast’s most important commercial fisheries. Currently there is a lot of concern about how overfishing may affect future populations and the future of the fishery. Fishing closures can allow marine populations to recover and regain higher densities while they aren’t being fished. If, in fact, density is really important to the reproductive success of scallops, we may have very good reason to continue longterm management practices that include permanent or rotational closures. However, if populations get too depleted, closures may be no good in those areas. Zone map from original 2010 closed areas. From Department of Marine Resources. Federal scallop fisheries have benefited greatly from fishing closures, particularly on Georges Bank. 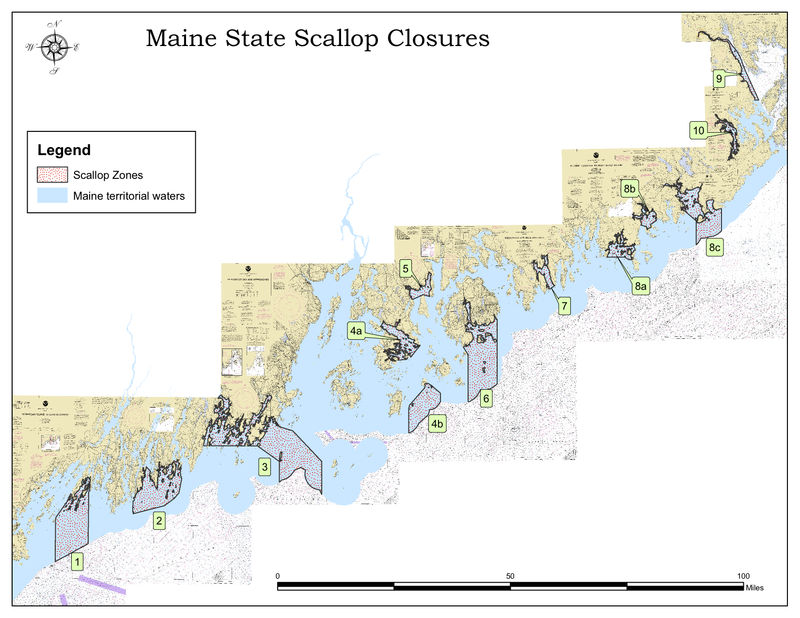 Our inshore scallop fishery in Maine decided to try closures about three years ago and this season (2012-2013) some of those closures are reopening. The new rules regarding fishing this season are listed here. Giant sea scallops are broadcast spawners – meaning that both males and females release their gametes (eggs and sperm) into the water column where, with a little luck, eggs are fertilized and develop into larvae. Depleting population densities of scallops dilutes gametes and makes that chance event of egg meeting sperm even more risky. This might affect the creation of future generations of scallops for the worse — something we are trying to figure out with fertilization experiments. 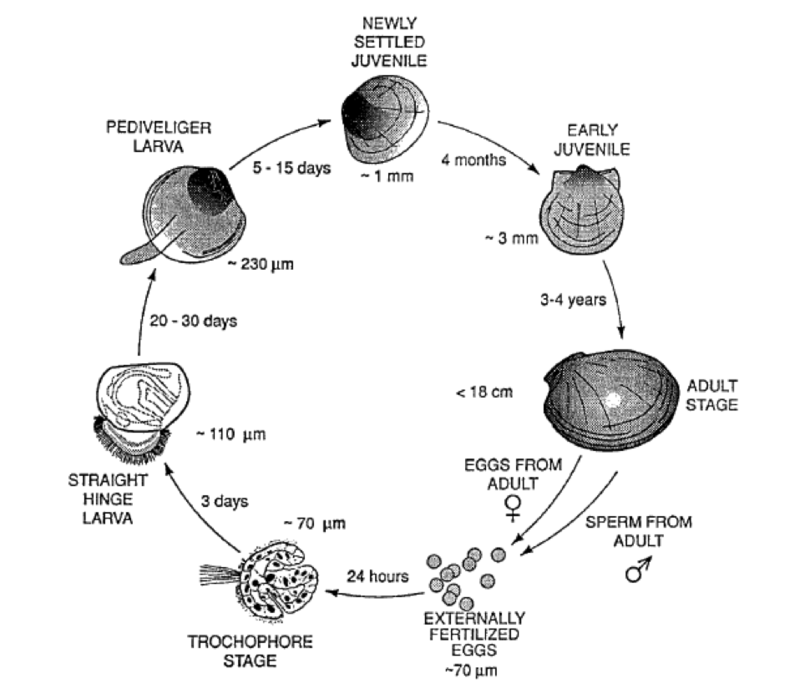 The life cycle of a giant sea scallop (Placopecten magellanicus). From Stewart and Arnold (1994). Here’s a short video showing us doing a little bit of our work at the Darling Marine Center. 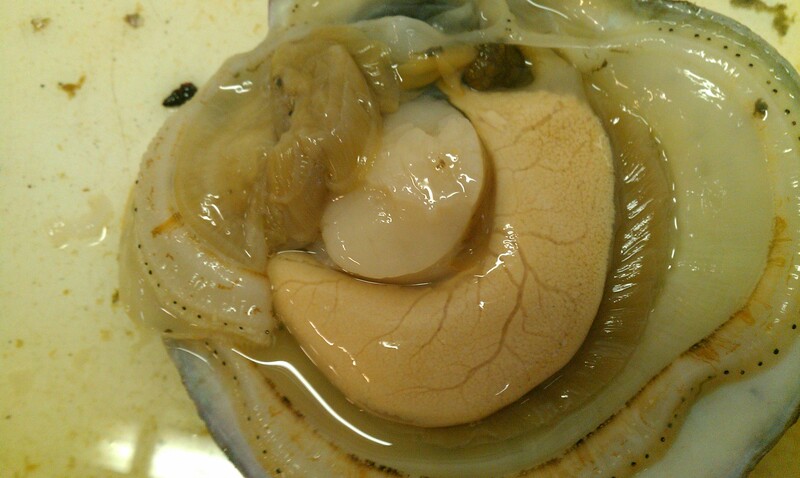 Ripe male gonad (big white crescent moon organ) with rest of scallop guts (total soft body tissue). The scallop gonad (called a gonad for both males and females) is a crescent-moon shaped organ that fills with gametes (eggs or sperm) and expels or reabsorbs them during the year. 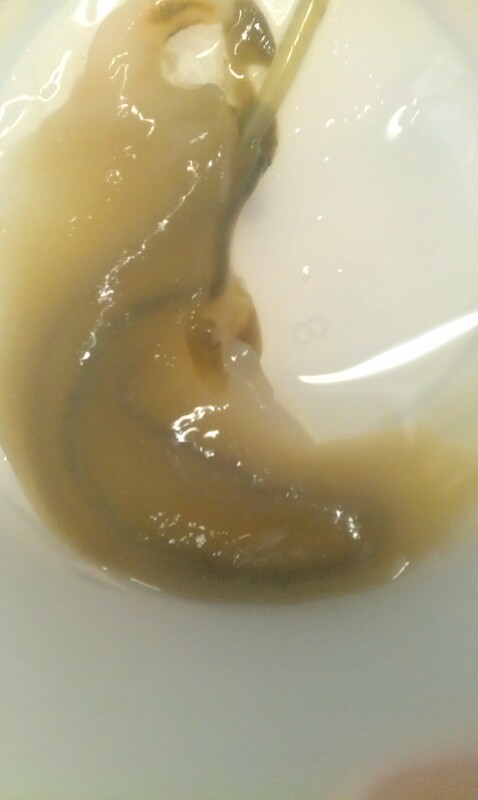 As seen in the picture below of a relatively empty gonad from the winter, the digestion track (dark, veiny line) runs through the gonad and loops back up to the stomach. The peak for gonad fullness is usually in the early summer in Maine and the peak of the spawning season is usually around August. I say usually because this year we had some early April spawnings and sometimes scallops don’t spawn until the fall. And I’m just talking about Maine. Canada, the mid-Atlantic and Georges Bank all have their own spawning schedules. Empty gonad showing intestine running through. Foot at top left of image and the cystalline style (thin long green rod) sticks out on the upper right of the gonad. So, why do I need gonad samples? This year is only my second year of my degree program and there are a lot of questions I’m trying to get some initial data on. One of those questions pertains to the gonad somatic index (GSI) of scallops along the shores of Maine. I am asking, are there are differences in the timing and frequency of spawning between scallop populations from different locals in Maine? One of these locations is in the Damariscotta River (where we do most of our experiments). The other location I have data from (in 2012) is Somes Sound in the Mount Desert Island Region (thanks to Andy Mays for his hard work). What does measuring the GSI of a bunch of scallops tell you? Ripe female gonad. (Held upside-down). Measuring gonad weights relative to soft body tissue (that is, all of the bodily organs inside the shell) of a population over time can give you an idea of when spawning was at its peak and how much synchrony there might be in the population. A high degree of synchrony might suggest that there’s one large external cue that all the spawners are responding to, or that fertilization success is greatly enhanced by a high degree of synchrony. If there are differences in peak spawning dates between populations (say between the Damariscotta River and Somes Sound), it’d be interesting to see if those dates correspond with local conditions — like seasonal peaks in temperature. 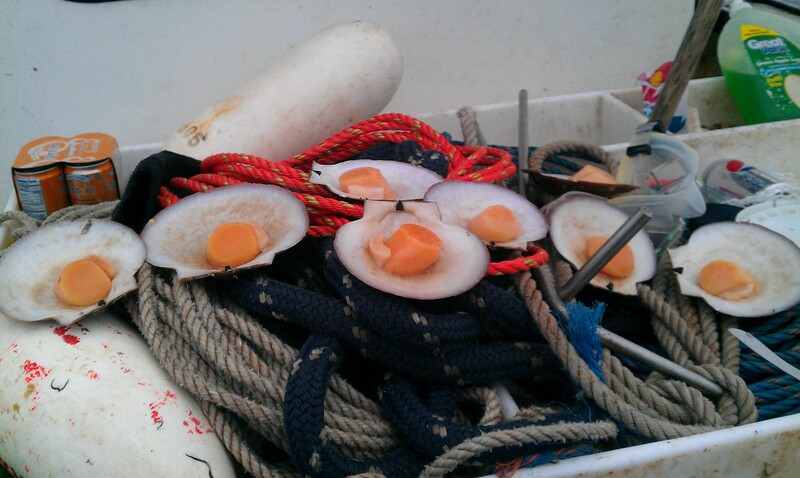 All this fertilization experiment and GSI data may have important applications for the scallop fishery. The way we conduct our experiments and model our fertilization experiments with programs like MATLAB might also provide important information and tools we can use when studying other broadcast spawning critters in marine protected areas and fisheries. In short, I’m stoked I got my samples back. Scallop meats in a half shell on Any Mays’ boat. Opening Day (December 2012). Stewart, Patrick L., and S. H. Arnold. 1994. Environmental requirements of the sea scallop (Placopecten magellanicus) in eastern Canada and its response to human impacts. Biological Sciences Branch, Scotia-Fundy Region, Department of Fisheries and Oceans, Bedford Institute of Oceanography. 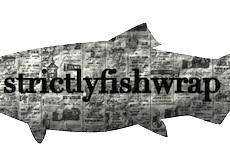 Plus, all this got to appear in Commercial Fisheries News!